Chinchergi prospect located some 15 km east of Hutti Gold Mine is an area of extensive ancient mining. Reconnaissance rock chip samples analyzing 5.59 g/t, 8.33 g/t, 9.92 g/t and 12.73 g/t were met within this prospect. Channel sampling revealed 1 to 2m wide narrow lodes analyzing 1.18 g/t to 4.38 g/t. Systematic bedrock sampling involving collection of 1500 samples helped to define a 80 to 200m wide anomalous zone of quartz veins with alteration haloes south of Chinchergi. Also observed was another similar vein- alteration anomalous zone, 75 to 100m wide, west of Chinchergi. Payable reefs are however, narrow; eg. 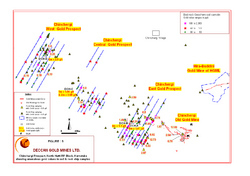 0.63 to 4.4 g/t gold over a maximum width of 4m for 400m strike length. Deccan Gold Mines Limited is a company listed on the Mumbai Stock Exchange and is involved in gold exploration activities in the States of Karnataka, Andhra Pradesh, Rajasthan and Kerala. Rama Mines (Mauritius) Ltd. acquired a majority stake in the company from the promoters of Wimper Trading Limited and followed this acquisition by making an "open offer" to the public, as per the requirements of the Securities Exchange Board of India regulations, in the year 2001. The name of the company was changed to Deccan Gold Mines Limited on 19 March, 2003. A rights issue to increase the paid up capital of the company to Rs.5 crore was undertaken in the year 2004.